The potential for autonomous buses to provide an accessible and flexible service for users at hospitals is huge. In a pilot project lead by Movia, we are responsible for operating self-driving shuttle buses over three phases: Inside SUH Køge, an outdoor area at Slagelse Hospital, and between SUH Køge and Ølby Station. 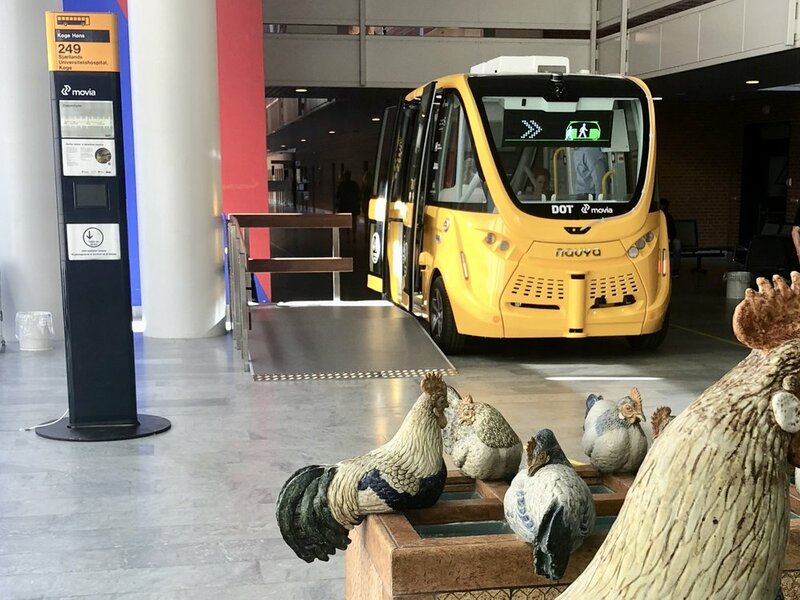 At the end of May 2018, the first driverless bus began transporting passengers through the lobby of Sjællands Universitetshospital, Køge. Driverless buses will in time drive to and from the nearest train station, allowing for a new way of moving around for patients and visitors. The driverless buses are the first part of a collaboration about the dissemination of driverless technology. The partners in the project are Movia, Region Sjælland, Region Hovedstaden and Metroselskabet. Driverless buses provide new mobility solutions to citizens: They are flexible, they can drive around the clock, they are safe, and they increase mobility. That is why a pilot project with driverless solutions is being introduced at SUH Køge and Slagelse Sygehus. The pilot project will give the partners invaluable experience of the service provided, as well as knowledge about users' experience with autonomous mobility. The pilot project is introduced over three phases. Phase 1, which was in operation from May 28th to August 24th, introduced a driverless bus in the lobby of SUH Køge. This project tested the bus’ ability to navigate in an environment with a lot of pedestrians and we had some informative user feedback as well. Next step is expected to launch in the beginning of 2019 where a shuttle service will be connecting departments at Slagelse Sygehus. The route outside the hospital will transport patients, visitors and staff around the hospital area, in a sustainable and safe way. In the third and final phase of the project, the bus will provide a shuttle service between Ølby Station and SUH Køge, providing a first/last mile service for people traveling to and from the hospital with public transportation. Overall, the first phase of the project has been a success. All partners have gained invaluable experience and gathered more knowledge about the autonomous shuttle service and how people respond to it. Users felt safe in the vehicle and had good use of the service - whether they were merely jumping on for a joyride whilst killing waiting time at the hopsital, or patients needing to be transported down the lobby of the hospital. The shuttle service ran for 65 days, transporting more than 6000 passengers throughout the project’s first phase. It ran safely down the lobby of the hospital, with lots of pedestrians walking closely to the bus and stepping out in front of it. Feedback from visitors and users of the hospital shows that people are curious about the project and trust the technology. We are currently not in operation in relation to this project. We are working on the second phase of the pilot project, which will launch in the beginning of 2019, at the outside area of Slagelse Sygehus. >> FIND THE ROUTES AND MORE INFO AT MOVIA'S SITE.